Spiritual work comes down to a change in #values. At first, my state seems hopeless. But gradually, the values change in me, and I feel the same state as good. I feel that I rise above my old impressions, and now I feel they were good. Spiritual growth occurs precisely through the opening of emptiness in a person, felt by descents. The void must be filled with the Creator’s greatness, in the group. All progress is in finding and filling voids revealing unsatisfied desires and filling them with the power of the Creator. In reality, the field that’s revealed to us in descent as darkness, is filled with light, the will to bestow, but not wishing to bestow, we feel bad! It’s like Pharaoh is in Egypt—instead of the Land of Israel and the Creator in it—this depends only on our perception, desire. If each person perceives upper light personally, it appears black from Malchut. But if we want to rise to Keter, then on the path from Malchut to Keter we must unite into a ten. Then it’s not Malchut, but Keter that starts to shine for us, not with black but with white light. It all depends on unification. In our world the forces of bestowal and reception mutually exclude each other, try to annul one another. But Kabbalah, the wisdom of reception, explains how to attain the balance of two opposite forces, where they will complement each other—then, between them, spiritual life becomes possible. What’s a descent? The Creator frees another layer of desire from ego’s power and it makes us feel bad. Because we are used to enjoying inside that desire, and now we can’t. But He gives us a chance to fill this emptiness with His presence, the force of bestowal, faith above reason. We must connect everything taking place in the world to our growing egoism. It evokes revolution, progress —and decline, similar to the periods when Jews lived in Egypt. Today the world is about to come out of egoism, to realize that ego is evil and the cause of all ills. Pressure on the Jews is growing. Powell, everything for the elite, and Trump @realDonaldTrump, everything for the country, have clashed. since precisely opposition against Trump builds his actions. The system of opposition works—and the people, the country, win! There are just two forces—bestowal and reception. All reality, the whole world, is based on them. #Kabbalah teaches how to bring them to balance, to the middle line. Its stabilization on all degrees, from zero to full egoism—this is the subject of Kabbalah. All contradictions are only between creation and the Creator, between us and Him. We must balance them out, bring them to the 3rd line, where we coincide with the Creator with our intentions. This is the goal of creation—absolute adhesion between two absolutely opposite forces. 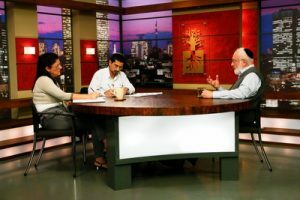 Question: If time and this world do not exist, except within the boundaries of the egoistic perception of the ocean of the upper Light, is it possible to leap in time with the help of Kabbalah? Answer: Of course you can. If I can integrate into a group, that is, by annulling myself and enter some Kli (spiritual vessel) that exists on a particular level, then I can make a leap in time as if in a spaceship. At the same time, I can alter my own states many times faster. As well, I can make leaps in space because I rise along with this group to its level and have them elevate me with their AHP. That is quite an interplanetary travel. Our material world is exclusively mechanical. You cannot change time, place, space or motion, except for within the framework that exists in it. Question: So, can I accelerate my spiritual development? Answer: If you accelerate your spiritual development, you remain in the spiritual spaceship, not the material one. You cannot do anything in the corporeal ship. Everything that exists here is dead. Question: We can’t even transport into the past here, a few million years ago? Answer: We can’t, and we’ll never be able to. You can only slightly alter corporeal time by approaching the speed of light, like Einstein said. Although you still will be unable to change anything because all this nearing the speed of light is purely mechanical, conceptual. Question: What does “jumping into the past” mean from the spiritual perspective? Or you could come into a strong group that you can influence so that you can disappear in it like an embryo in its mother’s womb, and it raises you to its level. This is called a “jump into the future.” Moreover, you can control jumping into the past or the future because they depend on your screen. When a ten attains faith above reason, it becomes a burning lantern, a bucket of oil from which you can light an infinite number of other lanterns. But first of all, this state called Hanukkah—clean oil approved by the stamp of the high priest, Cohen Gadol, this force of unity, faith above reason—must be achieved within the ten. The strength of our unity must become so powerful that it would defeat all the forces of separation. But it is thanks to separation that we increase the power of connection, burning the forces that push us apart, and raise our unity above them. Good only comes out of evil. Hanukkah (they rested here—Hanu Ko) is a respite between two wars. The war for the desire of bestowal happens first, before Hanukkah, and then the second one for the desire of reception. These are the two completely different kinds of war, so there must be a pause between them. We change our approach: at first, we wanted to reach the degree of Bina; therefore, we did not use our desire to enjoy. The more we rejected our ego, the closer we got to Bina. Upon completion of this war, we received the lantern with oil that burned for eight days. So, we see that our whole path was lighting these eight candles, the Light of bestowal, and attaining the quality of Bina. And now that we are on the level of Bina, we begin attaching the desires to receive to ourselves, to receive in order to bestow. Meaning, we gradually descend from Bina, each time picking up a certain desire in order to use it for bestowal until we bring it to Bina, to bestowal. This is the work of Purim. Our approach changes drastically from one war to the other. At first, we had a mandate: receive nothing! And now, it is the opposite: receive, even if it comes with some restrictions. This is a different attitude, a different goal. Hanukkah is not a construction. We did not build anything but only looked for sparks between the ruins, in the wreckage of a broken desire to enjoy. And after that, the construction of the Temple begins with the use of this desire to enjoy. That is, we achieve a common connection, including the egoism of each one as building material. The resting stop is necessary because you can not gradually transfer from one war to another. At first, the war was against reception. And when we reach the pinnacle of this rejection of reception on all levels and degrees of Malchut, meaning the level of Bina, then we have no choice but to make a stop before the new work begins. The younger generations are tired of life and are no longer willing to burn their lives for dollars as modern slaves in the workplace. Technological progress and the industrial revolution only helped the excessive human ego take advantage of the public to an even greater extent. Soon, the rich will no longer be free to make profit at the expense of the public since the global crisis will force us to transform our perception and approach on our way to equality. The integral approach pushes us toward connection in education, culture, communications, and everything that is needed in order to build a good environment all over the world. Competition and industry will be focused on creating global balance and providing for everyone’s real needs. The younger generations are already built according to this new approach. They know that success in life depends on the connection between us and not on one’s job.